I wonder if accessing the http session scope map from inside the application module is not a break of the MVC pattern. You can save the data you store in the userData object with some effort when the am is passivated and read it back when the am gets activated. MVC is not broken, we are just using public API of ADF BC. There is no import of any ViewController libraries - its the beauty of it. I am a little confused. At the moment I use only adf.userSession.userData for storing some needed values. It always means extra work for activation/passivation which enjoys no developer ;). 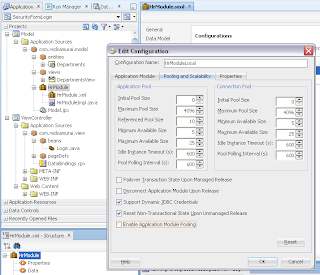 some comments like "you should not access the session scope from your model project" from John S.
So now we can say? 2. Use it only for environment type variables, if bind variable remains the same for entire session for example. 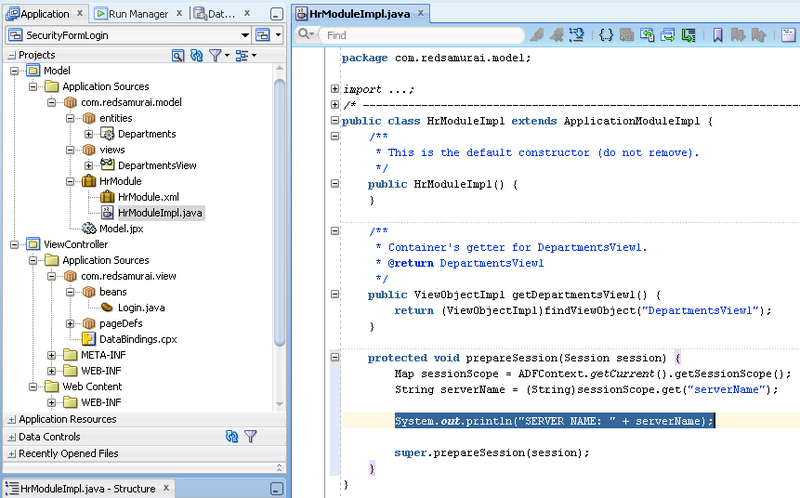 MVC pattern would be broken, if you would import JSF libs into Model and access web session through ViewController API. 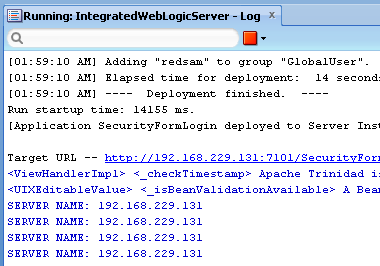 But here we are using only ADF Model/ADF BC API, so there is no violation. I have posted a related question in the forum thread "Should we try to access session scope in ADF BC ?" Very good, lets see Oracle feedback. I would like to point that your OTN Forum post is not exactly right - "Andrejus Baranovskis suggests it is no problem to access session scope in ADF BC using". I don't suggest it as no problem - but rather describe approach, and it depends from use case to use case what approach to choose. Also, MVC pattern is not broken, its just different access between framework layers is chosen. 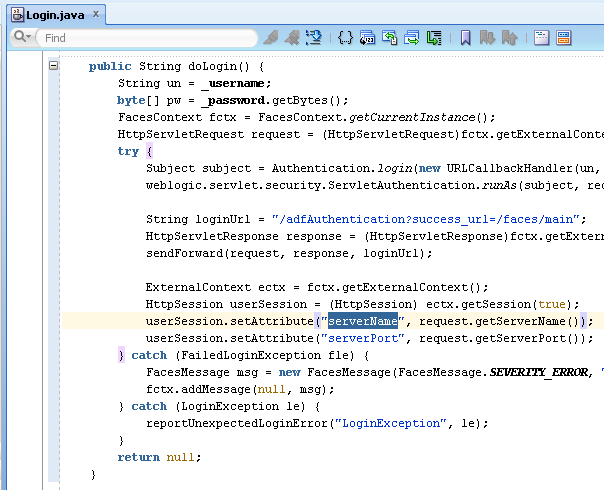 Question should be - why public API is available to access HTTP session from ADF BC context. Long time back, I got a chance to discuss with Maiko Rocha regarding some issues in our application. In the flow, at some point, he stated that ADFContext.getCurrent() should never be accessed in ADF BC. 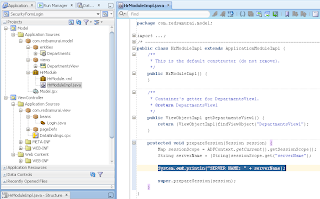 Instead, he suggested to make use of Custom JUApplication class to pass data from view layer to Application module by writing code inside beginRequest(HashMap pRequestCtx). After we read your post, we got confused. I wonder why he suggested us not to access ADFContext at Model layer. There can be different scenarios and use cases - sometimes its good and sometimes no. All depends on requirements and options to implement these requirements. I would argue about no access for ADFContext.getCurrent() in ADF BC. Even ADF Security context in ADF BC is accessed through ADFContext.getCurrent.getSecurityContext(). I prefer to access Session data in ADF BC from HTTP session, when working with user preference variables stored in HTTP session. I am trying to set the userId in the session while running the Junit test. Is it possible to set the session variable while running a unit test. Like, I need to set the currentUserId based on the user who is testing it. For this I have used a Jpanel component to get the user ID. Will setting the UserId or any session variables in this way a violation of the MVC pattern ? 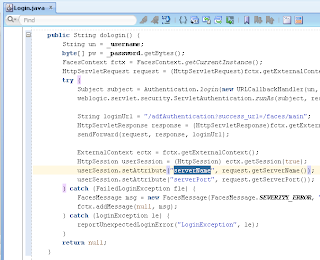 You can get User ID from ADF Security context may be? what happens to the variables stored in the HTTP session in a high availability scenario? 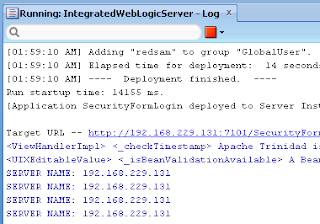 Will they get transfered to another server in case the one you are working with fails? I am currently testing an application with high availability, and anything in the session scope is lost when the server fails (even though the session itself isn't), so I'd like to make sure I am not missing anything. 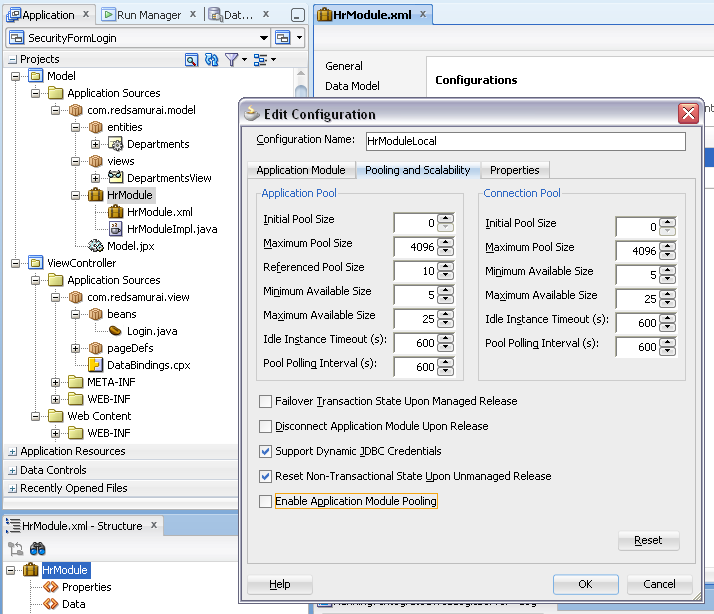 Store values in ADF BC and replicate ADF BC (basically store in DB). I am unable to download your zip file, although the code was quite helpful.